The following email was received at the Commonwealth Air Training Plan Museum in November 2017. The subject of the email is Carolyn Mowery, a veteran of the Royal Canadian Air Force Women’s Division in World War II. I get the emails from the Manitoba board of tourism and notice the link to your museum in it. I am the volunteer coordinator for the Minnesota Veterans Home in Minneapolis, Minnesota. We have a volunteer who comes and volunteers every Wednesday morning here, she’s been doing so for over a decade. She is also a WWII veteran who served in the RCAF as part of the Plan. She is 97 years old. I just spoke to her this morning and asked if she was familiar with your museum, she is originally from Winnipeg but hasn’t lived there in many year, and she had not but was interested. I assume you might be interested in her and her story. I have pasted a short newsclip from last spring that was aired on the local ABC affiliate here with her in it and then also a short write up that I put together to put in one of the volunteer newsletters, so you’ll have a little back ground on her. I know she is planning on going to Winnipeg to visit in April or May, although I know Brandon is quite a bit farther north. Carolyn Mowery turned 96 last August, but that hasn't slowed her down in the slightest. She still volunteers every Wednesday in the chaplaincy program at the Minnesota Veterans Home in Minneapolis and has residents she meets and visits with on a regular basis. She also hosts an annual "Goodbye Winter, Hello Spring" party for all 341 Residents there. This year's party was held Wednesday. Mowery served in the Royal Canadian Air Force during World War II, becoming the 158th woman from Manitoba to join. She traveled to London for six months in 1945. 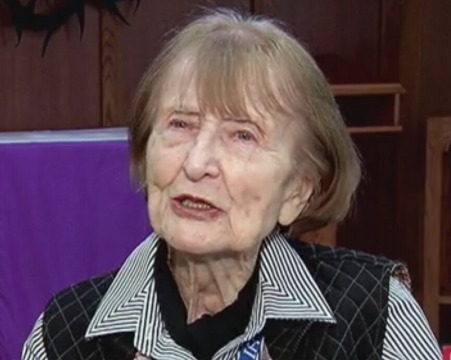 As Canadian prisoners of war were released from POW camps, she helped process them from hospitals in London to go to medical facilities back home in Ottawa. Her husband served as well, and she said she won't stop giving back until she's reunited with him. Canada entered World War II in September of 1939. By late 1941 England had suffered great aircrew losses in their Royal Air Force, thus England came to Canada to recruit replacements. Subsequently, the Royal Canadian Air Force was faced with needing replacements of their own and turned to recruiting women. The RCAF came to the University of Manitoba, where I was a student and I joined the RCAFWD or the Royal Canadian Air Force Women’s Division. The WD was later dropped. I was the 158th girl that joined the Royal Canadian Air Force from the province. I began my active service in January 1941 and was discharged in November 1945. I first served as an Airwoman 2nd Class and was stationed at an Elementary Flying Training School where the students were pilot-trainees. Among other duties, I served on Medical Emergency Teams. My chief duty was hand-holding, bandaging, and cleaning up crash sites. As this was a training school the pilots were novices and in addition to skirmishes there were also crashes every day. I graduated to visiting in hospital the pilots who were injured. I had no previous experience. During my years of active service I was stationed at about 15 different posts all around Canada. As the years progressed, with constant education, training, and promotions in the field, my assignment had a very special interest- planning for our Prisoners of War returning from Europe (mostly from Germany). I travelled to London for a 6 month period in 1945. As Canadian soldiers were released from POW camps, I helped process them from hospitals in London to go to medical facilities in Ottawa, Canada for whatever follow up was needed. Most of the young ladies in the RCAF were just out of school and most of the pilots were older and more mature, I remember fondly how they looked after the young female recruits as if they were there younger sisters and wanted to make sure they were protected and didn’t get into any trouble. I was discharged in November 1945. After my discharge, I returned to the University of Manitoba but remained in the Active Reserve Units during my studies. I graduated with a degree in biochemistry and eventually studied Psychology. For my graduate work, I moved to the University of Chicago, where I met my husband, John, a licensed clinical psychologist. He had served in the USAF, Pacific Theater, as a pilot throughout WWII. After I graduated, John and I were married, lived and worked for several years in Indianapolis, Toronto, and finally Minneapolis. After many happy years together, John suffered a fatal heart attack on April 12, 2005. And then the Minnesota Veterans Home- Minneapolis came into the picture! Chaplain Neil Hering invited me to join the Chaplaincy Unit as a volunteer and I did in July 2005. Again, thought she would be of interest to you, let me know if you have questions! Another great story from one of the one million Canadians who joined the armed forces in World War II. It is gratifying to know that even after 72 years when hostilities stopped in the war, people are still interested in the stories of those who were involved. We must continue into the future to assure that they are never forgotten. In the dying days of the war in Europe the Royal Canadian Air Force cobbled together a planeless unit called 8402 Disarmament Wing. It comprised 363 officers and men, 57 trucks and cars, five motorcycles, that reached-by sea and land convoy-its operating base at Oldenburg, Germany, May 20, 1945. The area of operations was 6,600 square miles in the northwest corner of Germany occupied by the Canadian and Polish armies. The purpose was to seek out all the Luftwaffe equipment it could find and destroy what was not useful for its advanced technology or in the war against Japan. A report of the wing's activities, dated April 15, 1946, five days after it closed down-and still marked "secret" -was discovered recently in the Public Archives of Canada among the memorabilia of a junior RCAF ground officer. Because the wing's members had few points in the repatriation scale, they considered themselves, the report says, "a lost legion of low pointers." The medical section of the report adds that the "appallingly high" venereal disease rate fell dramatically the moment word came through that the unit was going home-nearly a year after VE-Day. Morale had been so bad that wing officers had attended the trial in Aurich of Maj.-Gen. Kurt Meyer, condemned to death for the butchery of Canadian prisoners in Normandy, for something to do. Meyer was later reprieved and became a beer salesman to Canada's NATO brigade group in Germany. It will be no surprise to survivors of 6 Bomber Group or other Canadian combat fliers over Europe that the German air defence system was found to be highly sophisticated. 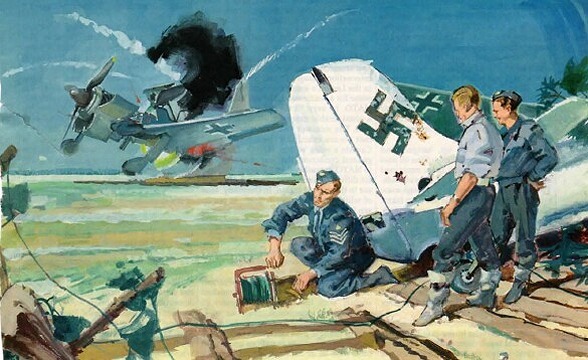 The wing established that German flak claims were "most accurate" by comparing them with RAF records, though reality bore little resemblance to broadcasts by Dr. Goebbels, the minister of propaganda. On the Frisian Islands of Borkum, Norderney and Juist, off the northwest coast of Germany, the wing found most Luftwaffe installations practically intact and the German air force staffs still on the sites. The officer in charge, Hauptmann Sobich, fell all over himself, the report says, explaining the anti-aircraft defences -until arrested for the murder of American airmen who had bailed out over the islands. The report adds: "This was a good initial lesson to staff on the character of the Hun-either at your throat or at your feet." A complete radar site, code-named Jaguar, was found on Juist. It was used for early warning, interception and night fighter control. A complete infra-red aircraft detection installation was found intact on Borkum. On the mainland coast a huge installation was discovered containing a completely new type of radar called "see Elefant" and used for long-range early warning. Ten barges were required to remove the equipment from Norderney alone to Hamburg for trans-shipment to England. One of the wing's most useful, but distressing, activities was locating Allied aircraft reported to have crashed in the area through interrogation of burgomeisters, clergymen, police and civilians, and by checking burial records. Details of more than 100 burials were obtained. The unit discovered the documents of the local Luftwaffe air-sea rescue squadron with particulars of many Allied fliers rescued from the North Sea. The wing's main targets were airfields, factories, air parks, depots, radar and experimental stations, and communications networks. Smaller targets included warehouses, barns, taverns, pigsties, and private homes. A house search at Elmenhorst on Dec. 4, 1945, turned up only Nazi literature. But on the same date at Wittmundhafen, the wing found several V2 rocket warheads and shipped them to England. A barge on the Osnabruck-Bramache canal was found containing four dismantled Heinkel aircraft. A section of Bremen's air defence system was uncovered: three fighter control stations, four jamming stations, a Fluke! (observer corps) plotting station, a listening and direction-finding stations. The wing searched vainly for weeks in a forest near Hesel for a reputed underground factory said to have been manned by 5,000 slave laborers. The wing had its own slave laborers of a sort: several units of 50 to 300 German prisoners of war, all from the Luftwaffe, who did the lifting and toting of captured war material. ''Discipline on the whole was very good,'' says the report of these "labor units." Each unit had a small police staff and the wing could mete out punishment of up to 10 days on bread and water. More serious cases were handed over to the military government. Periodic raids were made on the laborers' quarters by the RAF to search for firearms and other weapons. Deserters were mainly men with next-of-kin in the Russian occupation zone. 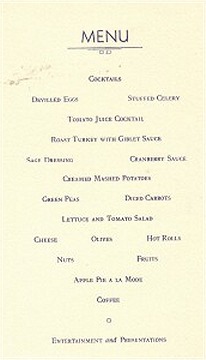 Rations for the laborers were set at 2,440 calories a day, later cut to 1,914 for workers on light duties, and there was only one complaint: a scarcity of potatoes. The wing shipped to England-no mention is made of Canada-826 aircraft engines, including jet engines, 12 radar sets and 258 tons of other equipment, including searchlights, recording devices, multiple rocket projectors, infrared telescopes, anti- aircraft sights, and optical equipment. It turned over three JU-52 planes to the Dutch. It destroyed 56 aircraft, 252 aero engines, and thousands of tons of explosives and air force equipment. The bomb disposal teams " kept banging away," the report notes laconically at one point. Runways were torn up, hangars and other buildings burned. Fifty of the 60 sites found with armament on them contained explosives, including V1 and V2 warheads. The explosives were detonated, though some bombs were dumped in the sea or in lakes. Some guns were reduced to scrap in forges. Incendiary bombs were used to destroy aero engines and other material. The Royal Navy blew up the flak sites. Several airfield buildings had been booby-trapped by the Germans. No wing personnel were killed or injured, but two German farmers were killed at Quackenbruck airfield when their wagon ran over a buried mine. Two Dutchmen were killed at Achmer when they stepped on a mine. Most of the casualties were among displaced persons, who broke into Luftwaffe stations and bomb dumps. The report says: "In their ignorance and child-like failure to appreciate danger, they engaged in the most appallingly dangerous practices. Even the considerable casualties had very little deterrent effect." Demolition often had to be stopped by DPs who refused to leave an area while they searched for any salvageable item. The report says that the first of 30,000 German refugees began to arrive in the wing area in October, 1945: "Their countrymen were not at all happy to receive them and their lot was indeed an unhappy one." Did the wing nab any war criminals? We are told only that arrests of "wanted persons" were made. Even the financial activities of the Luftwaffe in the wing area were thoroughly investigated. RCAF accounts officers found 3,826,093 Reichmarks of German air force money squirrelled away in 73 banks and transferred them to the "pool of Allied booty" in Hanover. All military funds in Germany had been frozen by the Allies on May 7, 1945. Payments out of Luftwaffe funds after that date resulted in the arrests and convictions- the number isn't given-of bank officials for embezzlement. Accounting records were found intact at three airfields and they revealed that in the war's last days all Luftwaffe personnel, including civilians, had been paid in advance for the months of May, June and July. There is no recorded case, at least in the operational area of 8402 RCAF Disarmament Wing, of any German giving back any part of his pay for non-performance of duties after May 7, 1945. AIR VICE-MARSHAL K M. GUTHRIE, C.B., C.B.E. No. 2 Air Command, R .C.A.F. In answering the call to help Canada's war effort, the challenge was at once accepted by the women of Canada. The work performed by the Royal Canadian Air Force Women's Division was a vital contribution to final victory. The cheerful and efficient manner in which you undertook and accomplished every task assigned to you won the admiration, not only of the men in the Service but also of the country as a whole. I would like to personally express my appreciation to all members of the Women's Division for your magnificent work and to wish each one of you good luck and happiness for the future. On the occasion of your departure from the Royal Canadian Air Force, I would like to take this opportunity of complimenting you on the fine record you have established both in Canada and Overseas. The manner in which all members of the Women's Division have performed their duties bas not only reflected great credit on the Women's Division but contributed in no small measure to the successful conclusion of hostilities. All tasks assigned to the Women's Division were efficiently carried out and were in keeping with the best traditions of the Royal Canadian Air Force. On behalf of every officer, NCO and airman of the Royal Canadian Air Force, I wish to express our thanks and appreciation for a job well done and extend to each of you our sincere good wishes for your future . May success and happiness continue to crown your every endeavour in Canada at peace. THE AIR OFFICER COMMANDING No.2 AIR COMMAND, R.C.A.F. At this time, my thoughts go out to all members of the R.C.A.F. Women's Division, who have served not only in my Command, but also in the whole R.C.A.F. I thank them for their magnificent service and wish them the greatest success in all of their endeavours. It is with deepest regret that on behalf of all members of my Command, I must now bid you "farewell!" Tube spirit of the Women's Division of the R.C.A.F. will remain with us, and if, in the future the call should go out to you, I am confident that you will respond with the same enthusiasm as you did in 1941. Initially, the Canadian Government was reluctant to recruit women for the RCAF. Those who wished to make a contribution to the air force, often moved to Great Britain and joined the RAF’s Women’s Auxiliary Air Force (WAAF). Others stayed home without the opportunity to join the air force. As the war ground on, Canada increasingly faced a manpower shortage, which applied to the Royal Canadian Air Force as well. Many men and women of the Royal Air Force found themselves to the burgeoning British Commonwealth Air Training Plan. Local women, without such an opportunity began to speak out about the inequity and the government listened. The CWAAF was born, later morphing into the RCAF Women’s Division. It was no longer an auxiliary, it was organization equal to that of the male part of the RCAF with women shouldering the same obligations and priveldges to the air force as the men experienced. The Woman’s Division was the first of the three Canadian military branches to admit women for service. At the start, only nine trades in the RCAF were opened to women. By the end of the war, Women’s Division members were employed in 69 RCAF trades.
. It was no longer an auxiliary organization but a true part of the air force. Originally there had been only nine trades open to women, however, encouraged by the success of the first intake, the number of available trades was soon expanded to sixty-nine. Eventually, a total of 17,038 women would be enrolled before recruiting ended in the spring of 1944. The Women’s Division, or WDs as they were popularly called, served throughout Canada, the United States and England where they became component parts of the RCAF Overseas and 6 Group Headquarters. By the end of the war, 28 WDs had been killed or died on active duty, and many had been decorated for their dedicated service. With the end of the war the Women Division was quickly disbanded and by December 1946 that last discharge had been administered. However, in a short five years, the RCAF responding to Cold War (sic) pressure would again expand and the Women’s Division was reinstituted building upon its wartime traditions. * The Canadian Women's Auxiliary Air Force (CWACs) was created on July 2, 1941 - the first Canadian military branch to accept women. A year later it was integrated with the Royal Canadian Air Force and renamed the Royal Canadian Air Force Women's Division.. The WDs first trained at Toronto's Havergal College, a private girls' school designated as "No. 6 Manning Depot." The first 150 recruits joined in October 1941 and completed their training on Dec. 1, 1941.. At its height in December 1943 the WD had 591 officers and 14,562 members of all ranks. Over 17,000 women - eight per cent of all RCAF personnel - served in the WD by war's end.. The WD was disbanded on Dec. 11, 1946 as the Canadian military was drastically reduced.. A key contribution of the WD was operation of the British Commonwealth Air Training Plan which trained 159,340 aircrew personnel (including 49,507 pilots) from Australia, New Zealand, England and Canada from late 1939 until March 31, 1945.. British Prime Minister Winston Churchill called the program "Canada's greatest contribution to the Allied victory"; U.S. president Roosevelt called Canada "the aerodrome of democracy.". In 1951 women were permitted to join the RCAF directly. They were accepted as pilots in 1979; in 1987 Canada allowed female fighter pilots.. CBC's Comrades in Arms debuted Oct. 2, 1942. It was the first broadcast of "combined operations" with Canada's army, navy and air force all contributing to the show. In addition to dramatizations it promised "Men and women will play their true roles in this radio feature series reflecting current history." Originally, only nine trades were open to women; however, duties expanded as the war progressed and 69 trades became available. Among the many jobs carried out by WD personnel, they became clerks, telephone operators, drivers, fabric workers, hairdressers, hospital assistants, instrument mechanics, parachute riggers, photographers, air photo interpreters, intelligence officers, instructors, weather observers, pharmacists, wirelessoperators, and Service Police. RCAF regulations at the time precluded women who possessed flying licences from flight instructing or front-line duty. Most WDs were located at British Commonwealth Air Training Plan and RAF training stations across Canada and Newfoundland, many served in Canadian operational stations, some served in the United States and many were posted overseas with RCAF Overseas Headquarters and No. 6 (bomber) Group. 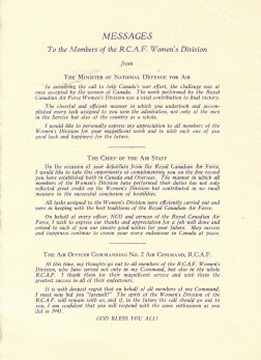 A Summary of the Royal Canadian Air Force Women’s Division in World War II When war was declared by Canada against the world’s Axis powers in September 1939, enlistment in the Canadian armed forces took a substantial jump by men, young and old wishing to get involved for reasons of patriotism, adventure and/or financial gain. Many women, with similar motivations went to their local Recruiting Centre with ambitions of enlisting as well. Much to their dismay, the army, navy and air force, following Government of Canada policy, prevented them from becoming soldiers, sailors and airwomen. However, the government changed its tune in 1941 as the enlistment of men slowed because of the huge draw of them into service in the first two years of the war. The pool had shrunk considerably and new male recruits were in short supply for combat and non-combative duties. The Royal Canadian Air Force was the first of the service branches to breach the enlistment of women barrier when Ottawa, with an order-in-council in June 1941, changed the eligibility of women to take on non-combative jobs in the Canadian armed forces. Women began joining the RCAF as their motto decreed: "We serve that men may fly." The first rounds of airwomen, joined the RCAF as members of the Canadian Women’s Auxiliary Air Force (CWAAF) which was modelled after the British Royal Air Force’s Women’s Auxiliary Air Force (WAAF). A number of women officers from the WAAF were seconded to Canada to assist with the implementation of the CWAAF. Princess Alice, Countess of Athione, was appointed Honorary Commandant of the RCAF Women’s Division. 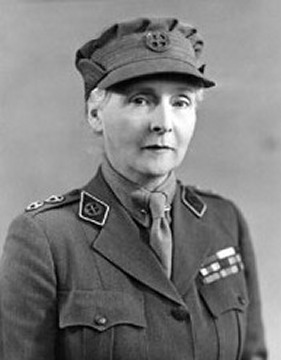 Honorary Commandant of the RCAF Women’s Division. As the number of women in Royal Canadian Air Force increased, more airmen were allowed to take their places in combat related jobs. Seeing the need to put some distance between the CWAAF and Britain’s WAAF, another order-in-council in 1942 allowed for subtle changes in management of the women and the group was renamed the Royal Canadian Air Force Women’s Division. The process of training and deployment of airwomen into air force jobs was similar to that used for airmen. The women were sent through the British Commonwealth Air Training Plan to pick up the skills and knowledge required to do their jobs in the air force. Upon completion of physical, mental and social testing at the Recruitment Centre, the women were sent to one of two Manning Depots (No. 6 in Toronto and No. 7 in Rockclffe (Ottawa)) to complete basic training, i.e. learn how to march, who to salute, how ranks worked within the air force, etc. From here, most women went on to various British Commonwealth Air Training Plan ground schools to learn their trades. In the early months of the RCAF Women’s Division, women were allowed to work in nine trades. As they proved their abilities, the list of allowable trades expanded to 69 by the end of the war. Women found meaningful work as clerks, telephone operators, drivers, hospital assistants, instrument mechanics, parachute riggers, photographers, air photo interpreters, intelligence officers, instructors, weather observers, pharmacists, wireless operators, service police, pharmacists, laboratory assistants and dozens of other trades. Many airmen were able to move into air force units in combat zones throughout the world as ground support workers and air crew flying fighters, bombers and transport aircraft. The results of integrating women into the Royal Canadian Air Force were remarkable. Over 17,400 served in the RCAF Women’s Division between 1941 and 1946. Over 1,000 became air frame and aero engine mechanics gaining certification for their abilities as tradespersons. Women were deployed to every British Commonwealth Air Training Plan and other RCAF facility in Canada and Newfoundland. Many WDs found work overseas with 1,500 serving in RCAF Headquarters and No. 6 Bomber Group, both located in Great Britain. Some were deployed to positions as liaisons with American government and military groups in the United States. Twenty members of the RCAF Women’s Division received the British Empire Medal, 12 received the MBE (Most Excellent Member of the British Empire) and one, Dr. Jean Davey received the OBE (Order of the British Empire). Twenty-eight women died during World War II while in service to the RCAF WD. Women also struck a blow for pay equity while service in the Women’s Division. When first allowed to serve in the RCAF, a women’s wage was 2/3 of that paid to airmen. Common thought at that time was that women could only complete 2/3 of the work of men. By the end of the war, women were receiving 80% of the wages given men. In 2017, this is a terrible situation, but it was a positive gain at the time. The increased wages for women found its way into the private sector, which up to that time, only paid 40% of that paid to a man. The following figures help to explain the important contributions made by women to the Canadian armed forces during World War II. As mentioned previously, 17,400 women served as WDs, 21,600 as CWACs in the Canadian Army, 7,100 as WRENs in the Royal Canadian Navy. Four thousand, four hundred and eight women served as Nursing Sisters in hospitals and other medical facilities in Canada and overseas of which 481 were attached to the RCAF. 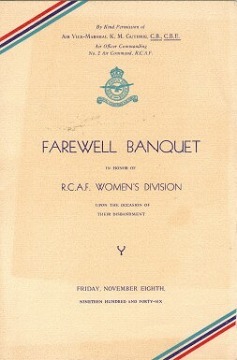 The Royal Canadian Air Force Women’s Division was disbanded in 1946. With Canada involved in the Korean War in 1951, women were once again encouraged to join the RCAF. This time they were not set apart from the men as members of the Women’s Division. They were enlisted as airwomen on equal footing with that of the men. Both genders followed the same service motto - "Per Ardua Astra – Through Adversity to the Stars." Women still serve with distinction in the Royal Canadian Air Force. The final barrier was breached in 1988 when women were first allowed to fly aircraft in combat. The world was at war! In 1939, Germany led by the fascist madman Adolph Hitler and his Nazi (National Socialist) Party was invading and taking European countries one by one, easily overcoming whatever resistance they could bolster. Countries fighting Germany’s imperialism had pepared for war with the same vigor as their foe. Great Britain, led by Prime Minister Neville Chamberlain, was counting on appeasement of the Nazis with a negotiated peace. Britain got the peace agreement on September 30, 1938, which Hitler violated less then 12 months later by invading Poland, another Allied country. Britain declared war on Germany in September 1939. Not only did Britain and its Commonwealth Allies enter the war, but found themselves in a battle to quickly and adequately equip their armed forces to beat Germany. World War II would become a highly-mobile and mechanized war which required among other things, air forces with modern equipment and the best-trained personnel. 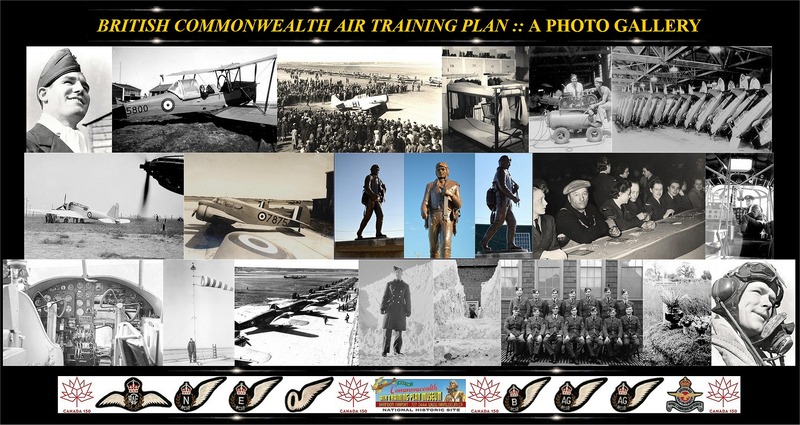 A scheme was required to provide the training for the Commonwealth Air Forces. It would have to be an enormous effort to recruit and train a highly skilled workforce. The countries of Great Britain, Canada, Australia and New Zealand banded together to create such a training scheme. Representatives from these countries, after months of negotiations, came together in Ottawa, Ontario on December 17, 1939 to sign the Riverdale Agreement, the document which gave birth to the British Commonwealth Air Training Plan (BCATP). They agreed that the BCATP should be built and operated in Canada. It was the logical choice for a number of reasons. Canada was a safe distance from wartime hostilities. It had an abundance of wide-open spaces and a favourable climate, both of which made for productive and unfettered aircrew training. Canada also, was capable of producing and delivering the goods and services and had a pool of skilled labour needed build and operate the BCATP. Originally, the Royal Canadian Air Force, Royal Air Force, Royal Australian Air Force and Royal New Zealand Air Force planned for the BCATP to generate sufficient numbers of aircrew for the war effort with three Initial Training School (ITS), 13 Elementary Flying Training Schools (EFTS), 16 Service Flying Training Schools (SFTS), 10 Air Observer Schools (AOS), 10 Bombing & Gunnery Schools (BGS), two Navigation Schools (ANS) and four Wireless (Radio Operation) Schools. The plan for the Plan was to train 50.000 aircrew each year – 22,000 British, 13,000 Canadian, 11,000 Australians and 3,300 New Zealanders. The British Commonwealth Air Training Plan came close to meeting this objective by providing over 130,000 pilots, observers, navigators, bomb aimers, wireless operators, flight engineers, air gunners. There were over 150 schools located in all of Canada’s nine provinces. Not only were students from the four Commonwealth Countries trained in the BCATP, but others from the United States, South Africa, Czechoslovakia, Denmark, Free France and Finland were also trained in the Plan. Canada’s BCATP was responsible for training one-half of the aircrew which fought for the Commonwealth Air Forces in World War II. It had become, and continues to be, the largest air crew training scheme in the history of the world. To make the BCATP work, the RCAF divided Canada into four regions with individual Air Training Commands located in each of the regions. The objective of each Training Command was to oversee BCATP operations and deploy human and material resources as needed to provide appropriate training in their region. The schools were set up to train three major groups of air force personnel – aircrew, ground crew and ground support workers. Aircrew were those who flew and operated the aircraft – pilots, navigators, gunners, etc. Ground crew were those who prepared and repaired aircraft with all of the associated flying and combat accessories for missions. Ground crew included mechanics, riggers, radio technicians, armorers, etc. Without the ground crew, the aircrew didn’t fly. Ground support workers were those who kept all of the non-aircraft things and processes going. Ground support included a multitude of other types of jobs. There were cooks, drivers, administrators, telephone operators, photographers, etc. etc. etc. All of Canada’s provinces provided space and resources to build and maintain schools for the three types of workers. When the BCATP reached its end in 1945, it had trained an equal amount of airmen and airwomen for ground positions as had been trained for air crew positions. Aircrew received training for seven trades – pilot, air observer, navigator, flight engineer, aid gunner, bomb aimer and wireless operator. Ground crew and ground support workers represented dozens of other trades. The following is a summary of the schools of the BCATP. Recruiting Depots – civilians applied to become members of the Royal Canadian Air Force at Recruiting Centres located in 16 cities across Canada. Enlistees would be subjected to academic, medical, psychological and social testing to determine their suitability for service in the RCAF. If they were accepted, they would be sent on to one of seven Manning Depots. Manning Depot – the first stop for all newly enlisted airmen and airwomen would be one of seven Manning Depots located in Toronto, Brandon (Swift Current) , Edmonton, Quebec City, Lachine, Toronto (Women’s Division) and Rockcliffe (Women’s Division). Here they received an orientation to the RCAF and learned the basics of life in the air force. They were taught how to march, dress appropriately, recognize and communicate senior ranks properly, etc. At the end of four or five weeks training, a selection committee would determine what job in the RCAF would be appropriate for the airman or airwoman. If acceptable, they would be sent on for training as aircrew, ground crew or other ground based jobs. Only Royal Canadian Air Forc personnel attended training at the Manning Depots. Initial Training School (ITS) – those airmen found suitable for duties as aircrew (pilot, air observer or navigator) would spend four to five weeks in ITS for introductory training in a number of subjects important to flying and performance of duties on an aircraft. Students would take courses in navigation, theory of flight, meteorology, algebra, trigonometry, air force administration etc. ITS was all ground school training – there was no flying. Students also undertook further health, education and mental health testing. The ITS gave staff a further chance to determine qualifications of a student for specific aircrew positions. Students did not always get the aircrew position they desired and some washed out of aircrew training completely, to be sent for ground school or ground support positions. There were seven Initial Training Schools in the BCATP. Only RCAF airmen attended training at the ITS. Elementary Flying Training School (EFTS) – students successfully chosen to become pilots at the ITS, would attend the EFTS for approximately eight weeks training and received a minimum of 50 hours flying training. The remainder of their time was spent with substantial ground school training. If the student successfully soloed in an aircraft and demonstrated an appropriate level of flying knowledge, they were sent for advanced flying training at a Service Flying Training School. The EFTS used de Havilland Tiger Moth, Fleet Finch and Westland Cornell aircraft for instruction. There were 26 RCAF and six Royal Air Force (RAF) Elementary schools in the BCATP. They were privately run with civilian instructors and RCAF or RAF management. Generally, pilots for the Royal Australian and Royal New Zealand Air Forces, qualified as elementary pilots before coming to Canada. They would start their BCATP experience at the Service Flying Training School. Service Flying Training School – students would attend 10 to 16 weeks of training with 75 to 100 hours flying time and more ground school training. The purpose of the SFTS was to build skills and knowledge in pilots to enable them to transition from flying simple aircraft like the Tiger Moth to something closer to actual combat aircraft like Spitfires and Lancasters. Pilots selected for fighter aircraft attended schools where they flew single-engine trainers like the North American Harvard. Pilots selected to fly bombers or transport aircraft attended schools where they learned to fly multi-engine aircraft like the Cessna Crane or Airspeed Oxford aircraft. There were 19 RCAF and 10 RAF Service Flying Training Schools in the BCATP. Air Observer School – students selected to become air observers or navigators would attend 12 weeks of training to learn navigation, aerial photography and reconnaissance techniques. Their AOS training was a mix of ground school and 60 to 70 hours of training in an Avro Anson aircraft. This training would be followed up with 10 weeks of training at a Bombing & Gunnery School and four weeks at an Air Navigation School. - Navigator B (Bomb Aimer) –eight weeks at Bombing & Gunnery School, 12 weeks at Air Observer School to qualify for navigation and bomb-aiming duties. Graduates were deployed to heavy, multi-engine aircraft such as the Lancaster and Halifax bombers. - Navigator W (Wireless/Radio Operator) – 28 weeks at Wireless School and 22 weeks at Air Observer School. Graduates were deployed to two engine fighter/bombers such as the Mosquito aircraft. - Air Bombers – 8-12 weeks at Bombing & Gunnery School, six weeks at AOS learning bombing, map reading and observation to assist the Navigator with his job. Air Gunners were deployed to heavy multi-engine aircraft. There were 10 Air Observer Schools in the BCATP. Although the new Air Observers were no longer being trained, the Air Observer Schools retained their title and adapted training to meet the needs of the new aircrew positions. The Air Observer schools utilized the Avro Anson for training. Bombing & Gunnery Schools (BGS) – Air Observers, Navigators, Bomb Aimers and Wireless Air Gunners took Bombing & Gunnery Training as a component of their air trade training. Air Gunners qualified for this position after six weeks of training at the BGS. Bombing & Gunnery Schools were located in 11 locations in Canada. The schools utilized the Avro Anson, Bristol Bolingbroke, Fairey Battle and Westland Lysander. Wireless School – Wireless Air Gunners spent 24 to 28 weeks at Wireless Training School learning the use of wireless (radio) and land based communications. A certain level of proficiency with the Morse Code was essential to pass. They were taught to pass on signals and messages via lights, flags and radio. Training would be completed with the WAG completing four weeks of training at a Bombing & Gunnery School. There were four Wireless schools in Canada which utilized extensive ground school training with training in flight with the Avro Anson. 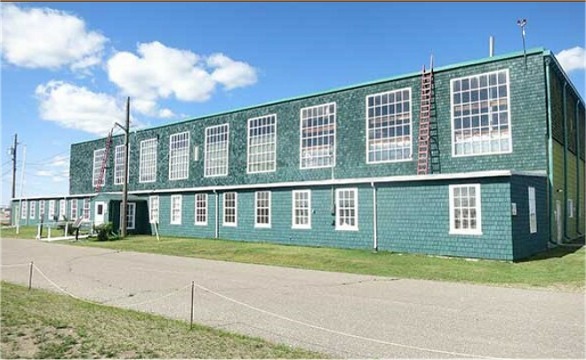 Naval Air Gunner School (NAV) – there was one Naval Air Gunner school in Canada located at Yarmouth, Nova Scotia. The Fairey Swordfish aircraft was utilized for training. Although it fell under the prevue of the BCATP, only Royal Canadian Navy air crew were trained at the naval school. Flight Engineer – received training as an aero engine technician responsible for monitoring and adjusting electrical and fuel systems and engines on multi-engine aircraft. Engineers were given enough pilot training to take over flying if the aircraft pilot became incapacitated. Most of the RCAF Engineers were trained in Britain but 1,900 were trained at Flight Engineer School in Aylmer, Ontario. General Reconnaissance School (GRS) – pilots, air observers and navigators were taught the techniques required to fly ocean patrol missions. The GRS was an advanced school equivalent to the Operational Training Unit (OTU) which were 'finishing' schools for aircrew prior to assignment to an operational squadron. Students were schooled in dead-reckoning navigation, astro-navigation, compasses and other instrument operation, meteorology, signals, codes, ship recognition, aerial photography and reconnaissance. There were two GRS schools located in Canada. Air crew trained on actual combat aircraft at the GRS. Operational Training Unit – like the GRS schools, the Operational Training Unit was where air crew received finishing training on operational aircraft such as the Hawker Hurricane. Fairey Swordfish and Consolidated Liberator. 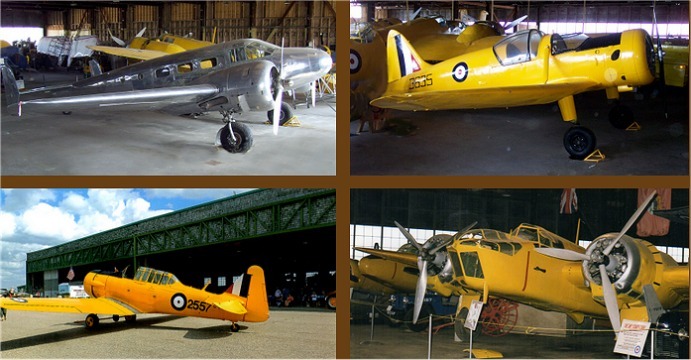 There were seven OTUs in Canada including three that were open for Royal Air Force aircrews. Central Flying School (CFS) was located at Trenton, Ontario. The objective of the CFS was to maintain consistent, high-standards of training among the flying schools. Flying instructors received advanced training at the CFS. The three Flying Instructor Schools came under the supervision of the CFS. 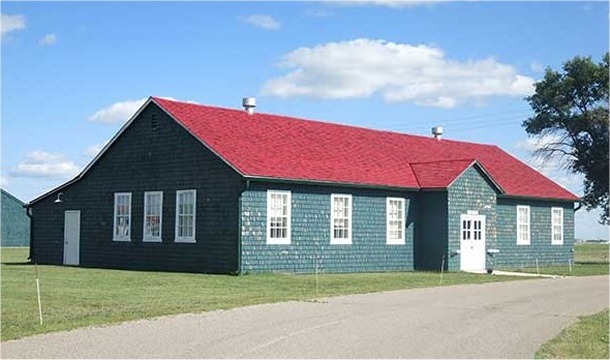 Central Navigation School (CNS) was located at Rivers, Manitoba. It was an advanced navigational school with the purpose of maintaining top standards in navigational training. Most of the graduates went on to be instructors at various other BCATP schools. The Avro Anson was utilized for training at the CNS. Instrument Navigation School (INS) was located at Deseronto, Ontario. Flying Instructor Schools were located at Trenton, Ontario, Vulcan, Alberta and Arnprior, Ontario. Generally speaking, flying instructors were selected from the best graduates from the Service Flying Training Schools. At Flying Instructor School, students were taught the techniques of teaching others to fly aircraft and then were sent on to the SFTS schools to teach other pilots advanced flying techniques. Dozens of air force jobs directly supporting air operations or operations of BCATP facilities required training at a number of ground schools located across Canada. Some of the trades taught at ground school were administration, cooking, aero-engine mechanic, air-frame mechanic, police services, photography and dozens of other trades. Air Armament School, Radio Direction Finding School, Radio Direction Finding (Radar) School, Composite Training, School of Aeronautical Engineering, School of Aviation Medicine, School of Cookery, Technical Training School, Equipment and Accounting School, Code and Cypher School. 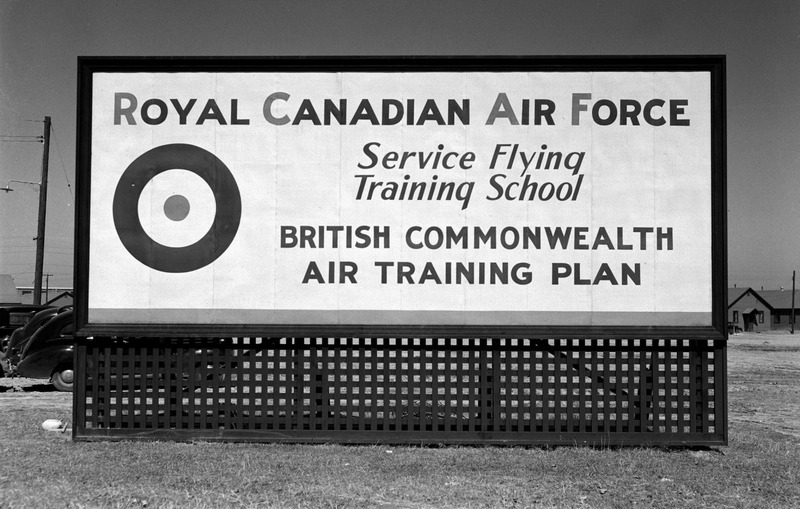 Total cost of the British Commonwealth Air Training Plan as of March 31, 1945 was $2.2 billion. Canada was responsible for $1.6 billion of the total cost. Canada assumed a large portion of Great Britain’s debt - $425 million. On the 3rd anniversary of the plan, United States President Franklin D. Roosevelt referred to the BCATP as the Aerodrome of Democracy. At the peak of training in late 1943 – 231 training sites (schools, relief landing fields, other facilities) were operating with 10,000 aircraft and 100,000 military personnel. Eight thousand buildings were constructed for the Plan. Seven hundred were hangars. Three hundred miles of water lines and 300 miles of sewer lines were installed at BCATP facilities requiring the movement of 2,000,000 cubic yards of spoil. One hundred sewage treatment and disposal plants were built. One hundred and twenty water pumping stations were built. Two thousand miles of power lines and 535 miles of underground electrical cable were installed at BCATP facilities. Merchants provided all kinds of items to BCATP facilities under construction including gravel and lumber. Laborers and tradesmen received payment for labor to build BCATP facilities. Employees, students and instructors at the schools brought with them a demand for housing, clothing, groceries, recreation to the local city or town. Many locations had ongoing needs for local goods and services such as electricity, water, natural gas, coal and food to BCATP facilities. Social benefits came to citizens living near the schools through interaction with those living at the schools. Both shared parties, dances, open houses, graduations, sporting events bars, pubs and cafes. While in Canada, 3,750 Royal Air Force, Royal Australian and Royal New Zealand Air Force personnel met and married Canadian Women.
. . . then. . . The Commonwealth Air Training Plan Museum (CATPM) is dedicated to commemorating the British Commonwealth Air Training Plan (BCATP) and those who served in it as students, staff and civilian workers. The BCATP was an enormous aircrew training scheme which supplied over 130,000 pilots, navigators, air observers, air bombers, air gunners and flight engineers to the Commonwealth Air Forces in World War II. When Great Britain and the Commonwealth countries declared war against Germany in 1939, the BCATP was created to provide the air forces of Great Britain, Canada, Australia and New Zealand with large numbers of highly-qualified aircrew to operate the sophisticated combat aircraft of that time. An agreement was struck by the four countries in December 1939 to create the British Commonwealth Air Training Plan. The agreement stipulated that the BCATP was to be built and operated in Canada as it was removed from the war hostilities of Europe. It provided the advantages of wide open spaces and generally good weather, essential for providing ample opportunities for students to fly. Canada also had the resources and 'manpower' to build and operate the Plan. The Royal Canadian Air Force (RCAF) was charged with operating the plan. Between 1939 and 1945 over 200 flying schools and other facilities were set up in all nine provinces of Canada. Eight thousand buildings, including 700 aircraft hangars, were built. Ten thousand aircraft were acquired for aircrew training. When the plan wrapped up 1945, over 130,000 aircrew had been trained for Commonwealth Air Forces to help win the war against Germany, Japan and Italy. An equal number of airmen and air women were trained for ground crew and ground support positions. 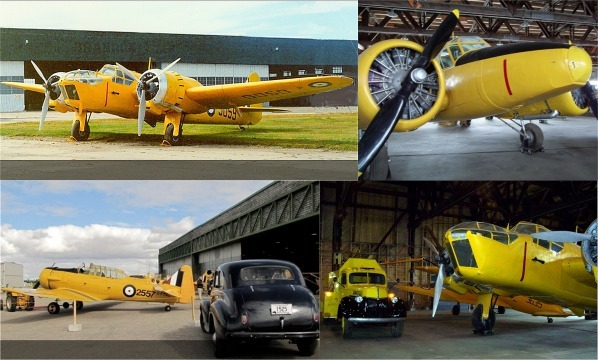 The Commonwealth Air Training Plan Museum (CATPM) was created in 1980 when a small group of volunteers, determined to preserve the memory of the BCATP, sought and received permission from the City of Brandon to open the museum in Hangar No. 1 at the Brandon Municipal Airport. The group purchased five aircraft which had been used in the Plan. With renovations complete, which included a heated area for display of small artifacts, the museum opened its doors to the public in 1981. From this small band a force of hundreds of subsequent volunteers and paid staff have fostered continued improvements to the museum. Locating the CATP Museum in Hangar No.1 was an inspired idea. That building was one of five hangars built for No. 12 Service Flying Training School (SFTS) at the Brandon Airport in 1940. Since opening, volunteers have expanded the museum to include four additional buildings which could have been present at any BCATP school during the war. Even though the museum is located where No. 12 SFTS used to be, the museum has kept the site and displays `generic’ so that the message provided applies to any and all schools in the BCATP. A second important objective of the Commonwealth Air Training Plan Museum is to collect and preserve artifacts and archival materials from the BCATP and World War II. The collection numbers more than 30,000 items. a) Heated Display Space – a 4000 square foot space to display small artifacts and archival items to visitors. Our displays tend to each show specific sub-themes from the BCATP which together give the complete story of the BCATP. 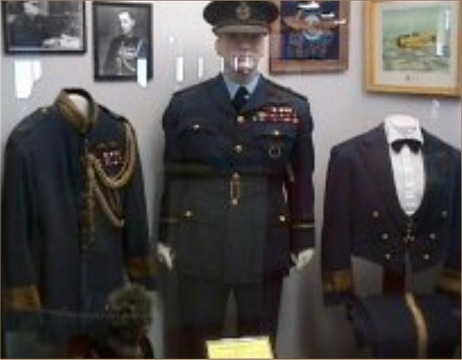 Items on display include photographs, uniforms, dioramas, medals, weapons, electronic items, aircraft equipment, ground crew equipment, training aids and personal items important to those who were at the BCATP schools. Special displays include the Barber's Book - a series of four books created by Jack Taylor, owner of the barber shop which was located in No. 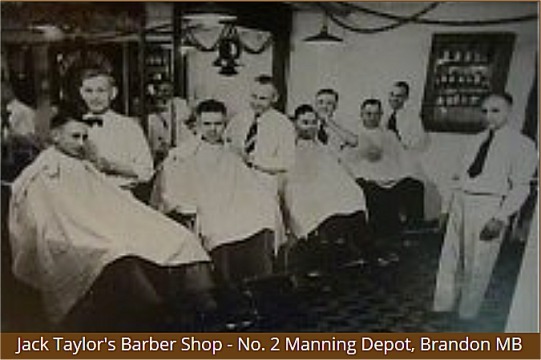 2 Manning Depot, also in Brandon. Twenty thousand airmen from 32 countries signed and noted their home towns in these books when they stopped in for a trim while residing at the Manning Depot. Visitors can view the names in copies of the books on display. Staff will help visitors searching for a name by accessing a computer data base with the information. A special room is the Chapel. Adorned with stained glass windows, church pews, a pump organ and a multitude of small artifacts once owned by airmen, airwomen and families. It is a place dedicated to those who lost their lives in the war. Their stories are told by the letters, telegrams, medals, and other personal items on display The museum’s memorial book They Shall Grow Not Old, and a digital version of the memorial book, are located in the Chapel, for visitors to look up loved ones who may be in the book. 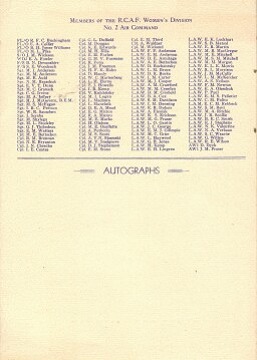 The book contains the names and small biographies of the 18,000+ airmen and air women who gave their lives in service to the RCAF and other air forces of the Commonwealth. 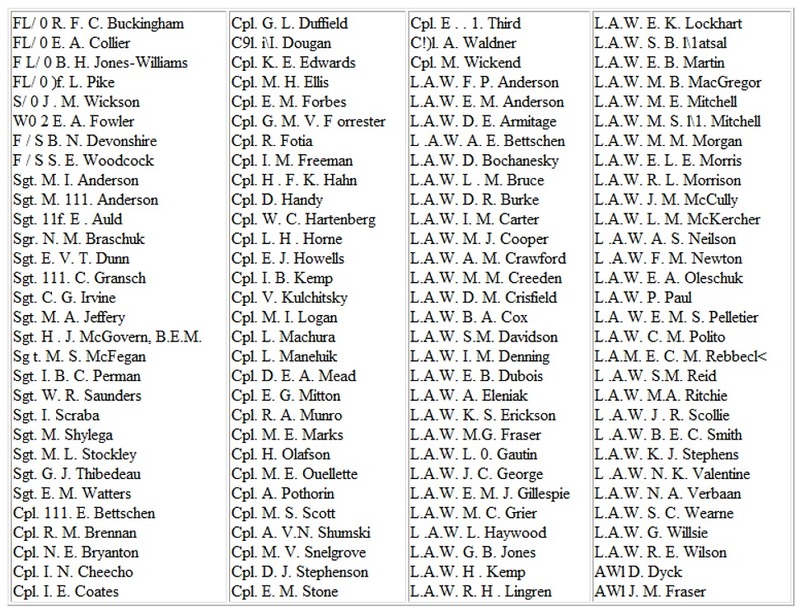 It also contains a list of those from other Commonwealth air forces who were killed while training in the BCATP. Visitors are invited to peruse our gift shop for a great selection of relevant souvenirs. A large heated space in the hangar serves as home base for our maintenance and restoration workers. From there, maintenance for all buildings on site is undertaken by our skilled workers. An impressive example of their work is the dozens of authentic copies of the World War II wooden style windows, which were built in our shop and installed in museum’s buildings. Restoration work in the shop includes work on our motor vehicles and two aircraft currently being restored for static display. The greatest portion of Hangar No. 1 is devoted to the display of the museum’s aircraft collection, a good portion of the museum’s motor transport collection and a link trainer – a WWII flight simulator for pilots in training. Visitors will enjoy the easy access to all of the aircraft and vehicles, all within touching distance. On special days when our aircraft are taking flight, the large hangar doors are open and visitors are allowed to walk up to the apron and see the aircraft in action as well as the comings and goings of the airport itself. Some of the aircraft on display The Canteen is also a survivor from No. 12 SFTS. It, like Hangar No. 1. Is located on the exact spot where it was built in 1940. In the mid-1990s, the Canteen was moved off its old foundation, a new one was built and the building was returned to its original location. Volunteers restored the interior and exterior of the canteen to its World War II splendor and installed modern mechanical systems inside. It is a geothermal cooled and heated space available for groups of up to 175 people for meetings and social occasions. It can be used in conjunction with outside green spaces for summertime parties. Catering can be provided if requested. The Canteen The Motor Transport / Beam Approach building was built brand-new to wartime Royal Canadian Air Force specifications. It mimics the purpose of the original building providing storage to motor transport vehicles in six garage bays. The west end of the building is a duplicate of a Beam Approach facility. The Beam Approach was common to RCAF airdromes and a must for student pilots to learn. Pilots could use Beam Approach radio signals to find their way in for a safe landing. The Medical / Dental building is a small structure, original to No. 12 SFTS but re-located after the war to a new site near the museum. It was used to treat dental patients and medical patients with minor issues, or the need to be transferred to the Brandon General Hospital. It is a priority for future restoration. H-Huts were numerous at BCATP schools but unfortunately, none were left standing at No. 12 SFTS after the war. A WWII vintage H-Hut was obtained at CFB Shilo and moved to the museum where it has been restored with modern mechanical systems inside. Originally, hundreds of airmen would live in each H-Hut while training. Our H-Hut now serves three purposes. It provides space for CASARA, a local search and rescue group, as a home base and meeting space. The H-Hut is the location of the museum’s library, stocked with thousands of books related to the BCATP. Although it is not a lending library, visitors can gain access though our librarian. The H-Hut is home to our archives. When small artifacts and archival items are received at the museum, they are processed, documented and safely stored in the archives. Artifacts and archival items are made available for displays or research through our archival staff. This collection has over 30,000 items. Bristol Bolingbroke (static) – on display off site at the Comfort Inn at Brandon on the Trans-Canada Highway. In September 2014, the Commonwealth Air Training Plan was proud to dedicate and open to the public, the RCAF World War II Memorial. It is a 300 foot black granite wall with the names and ages of the 18,000+ airmen and air women killed while in service to the RCAF and Canadians killed in service to other Commonwealth Air Forces. It also lists those aircrew from Great Britain, Australia and New Zealand killed while training in Canada. The source for the names is They Shall Grow Not Old, the museum’s memorial book. Accompanying the memorial wall is a bronze statue of an airman overlooking a secluded area for quiet reflection. 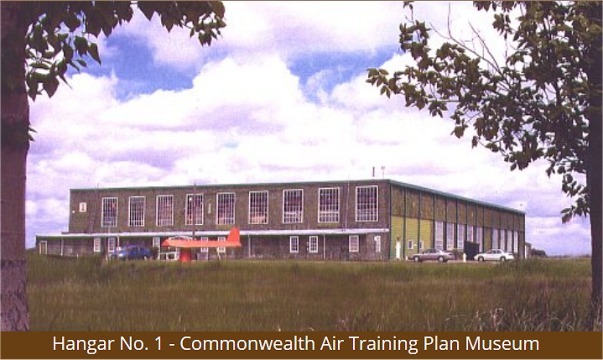 The Commonwealth Air Training Plan Museum Foundation is an entity of the museum, but managed by a board separate from the museum’s general board of directors. The Foundation is responsible for raising funds for operating costs and special projects at the museum. CONTACT is the Commonwealth Air Training Plan Museum’s quarterly newsletter which is sent out to members and selected supporters of the museum. 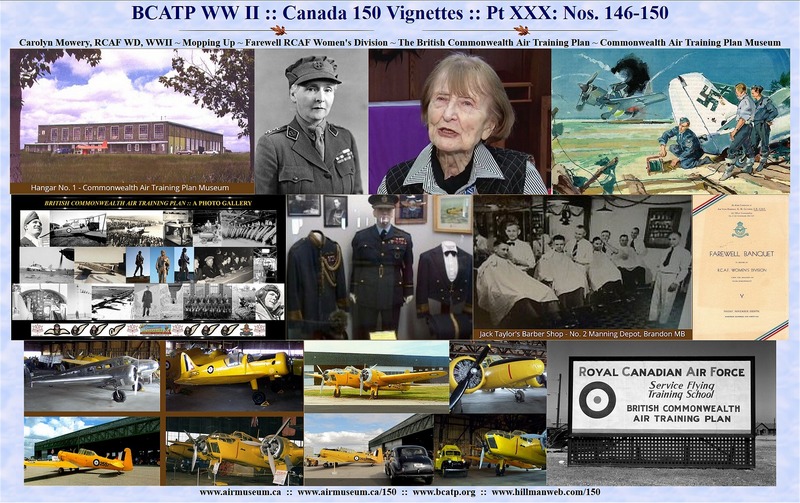 Published every three months, it reports to members current topics of interest and historic articles related to the BCATP, the RCAF, World War II and the Home Front. The Commonwealth Air Training Museum Web Site can be seen at www.airmuseum.ca . It is a great collection of articles and pictures related to the BCATP, the RCAF and other topics from World War II. The Commonwealth Air Training Plan Canada 150 Project celebrates Canada’s 150th birthday in 2017 with 150 Vignettes (short stories) about the BCATP and other World War II topics. It can be seen at www.bcatp.org or on the museum’s web site. The Commonwealth Air Training Plan Museum’s Facebook page can be seen by searching for BCATP Air Museum (https://www.facebook.com/groups/495628767121583/ ). The Facebook page produces a regular series of articles related to the Commonwealth Air Training Plan museum events and displays. A long time supporter of the CATPM is the Ladies Auxiliary. Over the years, the Auxiliary has contributed many thousands of dollars to benefit projects at the CATPM museum including provision of the kitchen in the Canteen building. It has hosted and catered many business and social events at the museum. The CATP Museum is one of seven Manitoba Signature Museums which preserve and display themes important to the history of this province. Visitors are invited to visit the CATP Museum. Single, Family and Group admissions are available Guided tours will be provided when requested.